If dry cleaners in Austin can clean it, so can we! Dry cleaners in Austin have it all wrong. Wet cleaning is the way to go. The dry cleaning chemical perc is bad for your clothes, your body and the environment. So we don’t use it. We use fresh water and biodegradable soap to get your clothes nice and clean—without the stinky dry cleaning smell or yellow look. Once garments are clean, they’re professionally pressed and hand-finished by our staff of experts. EcoClean is a full-service Austin dry cleaner. You buy organic food, but how natural is your dry cleaning? Most dry cleaners are still using industrial solvents to clean your clothes. Yikes! EcoClean’s non-toxic method cleans dry-clean-only garments using biodegradable soaps, conditioners, and pure, clean water. Have you ever wondered what the heck DRYCLEANING is? It means cleaning clothes in chlorinated petroleum solvents, chemicals that pollute our air, water and soil. For many cleaners Austin is just where they do business. For the rest of us, it is where we live. We value our reputation as a responsible cleaning service in Austin, TX. That is why EcoClean is Austin’s most environmentally sustainable choice for cleaning dry-clean-only garments. From day one, our goal has been nothing short of revolutionizing the garment care industry. We are reinventing everything from how your clothes are cleaned to how to make your experience convenient and enjoyable. We strive to be the best dry cleaners in Austin! Our premier dry-cleaning service is designed to exceed our customers’ expectations at every turn. Wet Cleaning is the best way to professionally clean your garments and when you call or email us with a question or concern, we will get back with you that business day. Stop wondering “Who are the best dry cleaners near me?” and contact EcoClean! With our new on demand dry cleaner app you can sign up for service, schedule a pick-up, check your account status and update your credit card all at the touch of a button. We even offer a full service wash and fold in Austin! We have extended our service times to accommodate a wide range of work schedules and Austin traffic. We are open from 7am-7pm weekdays, 9am – 5pm Saturdays, and are the only cleaner in Austin that is open on Sundays. We’re the most accommodating and best dry cleaners in Austin! Wet cleaning is an eco-friendly dry cleaning process that can clean virtually any garment that can be dry cleaned. We use biodegradable detergents, fiber conditioners, fresh water, and computerized washers and dryers to clean your clothes. Wet Cleaning was developed over 20 years ago in Germany as part of their commitment to ending the use of toxic chemicals in the dry cleaning industry. Clothes that have been wet cleaned smell fresh and have a softer look and feel than clothes that have been dry cleaned. Do you value an environmentally responsible laundry service? Choose EcoClean! 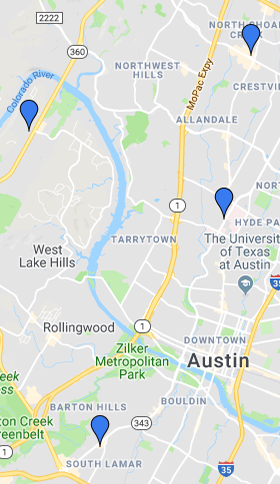 EcoClean offers free pick-up and delivery throughout the Austin area (Central Austin, Westlake, Bee Cave, Circle C, Sunset Valley, Mueller, Wells Branch, Jollyville, and Anderson Mill). With our new app, scheduling a pick-up is easy. Just open the app, pick a time and hit the schedule button. Your cleaned & pressed clothes are delivered back to you within 48 hours. When you schedule a pick-up, you will receive a text from your route driver when your items have been picked-up. You will also receive a text when your items are delivered back to you. We understand our customers’ needs and concerns and take them seriously. Whether your having your wedding gown preserved or your favorite old flannel cleaned, we get it… it matters! When you trust us with your garments, we treat them as if they are our own. No detail is ignored. Our cleaning and pressing teams have over 80 years of combined garment care experience and take enormous pride in their work. Our customer service team and managers are committed to making sure your questions are answered and your expectations are exceeded. We love what we do and are always happy to discuss your needs and find solutions for your cleaning challenges. EcoClean provides FREE dry cleaning delivery service for our eco-friendly dry cleaning throughout Austin. Service available Monday through Friday with two business day turnaround. Are there dry cleaners near me? You bet, EcoClean is available at your front door!